Goyo versus “El Hombre” —or— A Great Start to Valentine’s Night | ¡VidaMaz! So here it is Valentine’s Night. Saturday night—we are on our way to dinner downtown. We are treating ourselves to a nice night out at an expensive restaurant we have never been to before. It is dark out, just after 7:00. I pull onto the Avenida Del Mar and ease into the flow of traffic. Very light for a Saturday night. Okay with me, we’ll get there early and have more time to find a parking spot. As I go past the most commonly referred to landmark, The Fisherman’s Monument (also called Monos Bichis, or “naked mannequins” by the locals), the road opens up as traffic all but disappears. The road gets a little windy as we begin a slight assent along the rocky shore. As I execute a bend in the road, my eye is caught by a flashlight being shined into our car from the side of the road. A lone motorcycle police officer stands some 30 feet from his bike and is shooting a beam of light straight into my face. I look at the huge digital display on our dash and see that I am doing 51 kilometers per hour. By the time I pull over, I am a good few hundred feet from this man, who is now my bitter opponent in what will be a bloody battle to the end for our hard earned pesos. Ahh, I think, if I back up and get closer to him, it will give me points for saving him the long walk. I demonstrate my driving skills by backing up yet still following the curve of the road. American driver indeed, he’ll know he is dealing with a local when he sees me. I put the car in park and roll down the window. At this time I realize that I am parked in the darkest part of the damn road. This Mordida Fund that I have stashed in the center console is all but irretrievable, lost to the dark abyss of the too-deep console. How can I offer this man a reasonable bribe if I have to enter the console and spend five minutes showing him how prepared or unprepared I am for this monumentous event? I guess I’ll need another strategy. I quickly tell Danny to say nothing and let me do the talking. I assume Dianne already knows. The officer approaches and I give him a hearty “Buenas noches” in my absolute worst Spanish. He asks me in Spanish if I know how fast I was going and I again offer up “Buenas noches.” He then asks where we are from. “Vivimos aquí” (we live here), again in my worst Spanish possible. I figure if he can’t tell me what I did wrong, he will have to give up. He wants to know where we are going, so I make him ask about three times and I just keep staring at him like I really want to understand, but have no clue what he is saying. Finally, I relent, and say “restaurante en la plazuela.” I said it poorly enough that he says it back to me in perfect Spanish and I give him a celebratory smile—now we are communicating. He asks who is in the car with me and I proudly point out, “mi esposa y mi hijo.” Two in a row, uh oh, back to the speed thing. He tells me the speed limit on the street is 40. I repeat in Spanish, Cuarenta (40), and point at my dashboard to show that I understand. Feeling like he can strike pay dirt, he goes back to his first question and I again smile. He tries a few other ways to ask, but I’m not biting. He tells me again about the speed limit and I tell him again, “cuarenta, no mas (40, no more) and smile. I throw in a gracias and he wishes us a buenas noches and we are on our way. I feel bad for a few things. 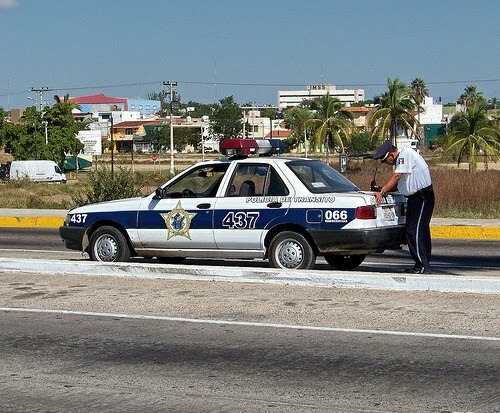 One, I was speeding and did deserve whatever punishment I am entitled, except when you factor in the fact that most traffic rules in Mazatlán are a joke. Second, it is no coincidence that this guy was set up in the darkest part of the street as to avoid the cameras installed along the Avenida with the expressed purpose of catching cops asking for bribes. 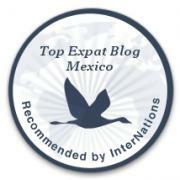 Third, it was Valentine’s and I could have given him enough pesos to get his wife a couple of roses or himself a six pack of Pacifico – his choice, but I would recommend the roses. I didn’t want to get into a bidding war which is what these too often can become. In my defense, if I had not stopped, he never would have caught me. He gave us something to talk about as we navigated the streets to our destination, obeying every speed limit, of course!